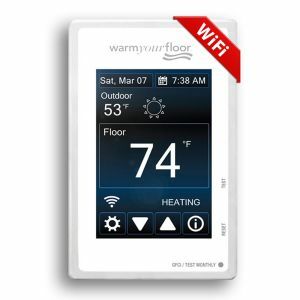 North America's first WiFi floor heating thermostat. The SIGNATURE thermostat can control one zone up to 15 Amps (typically 150 Sq Ft @ 120v & 300 SF @ 240v). Now compatible with multiple home automation systems! • Amazon Alexa - Compatible with any Alexa device including Amazon Echo, Eco Dot, and Echo Plus. • Google Assistant - Compatible with Google Assistant devices including Google Home and Home Mini. • IFTTT - Compatible with the IFTTT applet web-based service. • Nest - Compatible with the Nest learning thermostat. • Control4 - Compatible with the Control 4 home automation system. Download the Signature App from the Apple App Store or the Google Play store for free. Yes, temperature can be adjusted manually at any time.